The people gathered around the long white table in the conference room at University City Partners’ offices listened intently as Maddi Pleasant and Charles Trowell began their presentation. Joined by other members of their cohort, the Master of Urban Design students had been invited to present a master plan for development of the area around the intersection of North Tryon Street and Eastway Drive, a 25-acre tract of land that includes the North Park shopping center and the Old Concord Road light rail station. The students’ transit-oriented, pedestrian-friendly plan, which included retail, housing, office space, gardens and green spaces, was the result of a semester-long project in their fall design studio taught by Professor Deb Ryan. 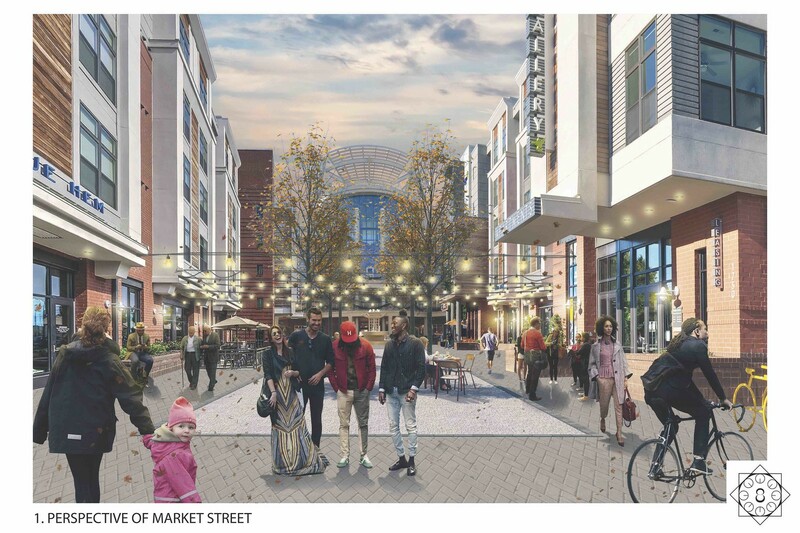 Eager to see a thoughtful and “aspirational development” of that heavily traveled and visually unappealing area, Darlene Heater, executive director of University City Partners (UCP), had suggested to Ryan her students take on the design challenge. Impressed with the results, Heater then invited the class to present to the large gathering at UCP—a group of private and public stakeholders that included Charlotte City Councilman Braxton Winston. Projects that offer solutions to real Charlotte problems are intentionally woven into students’ education in the University’s School of Architecture. And while there is no expectation that plans will be adopted and projects implemented, there is no doubt that the students’ work is shaping the city. This winter, giant printouts of the students’ plans and a model of the “North Park Transit Oriented Development” have been on display in the Government Center in Uptown Charlotte, making ripples. The alley off Gordon Street in the Plaza Midwood neighborhood is a drab and dirty lane that lies between a Sherwin-Williams paint store and Snug Harbor music venue. While the area is a hot spot for pedestrian activity day and night, the alley’s storm water drainage issues, poor lighting and frequent mud puddles make it a dismal place that deters strollers. Last fall, the Plaza Midwood Merchants Association approached Associate Professor of Urban Design Nadia Anderson and asked whether the School of Architecture’s City.Building.Lab, a research arm of the School of Architecture, would address the current eyesore with a design that would make it safe and functional and, in keeping with the Plaza Midwood aesthetic, funky. Anderson and four graduate research assistants, Jacob Huffman (urban design/geography), Amir Vafa (architecture), Tarah Weston (architecture) and Blake Wetherington (urban design/architecture), accepted the challenge, envisioning colorful murals, a brick walkway and festive strings of lanterns. And with a recently awarded placemaking grant from the City of Charlotte, the neighborhood will be able to implement the design. Construction starts this spring. In spring 2018, a studio of fifth-year architecture students, led by Ryan, developed a vision for the future of Charlotte that is based on research into Charlotte's history, studies of best practices in other municipalities, and input from Charlotte residents, with particular focus on the "millennial" generation. Two years ago, MUD students, led by Professor José Gamez and architecture graduate student and research assistant Amy Stewart, joined art students at Piedmont Open IB Middle School in an interactive workshop to design concepts for an area across from the school. Their proposals ultimately informed the efforts of the city of Charlotte and the Arts & Science Council, resulting in a new “tiny park” at 10th Street and Jackson Avenue. The project included new sidewalks and curb extensions to improve safety for students; a low retaining wall designed to double as seating for an outdoor classroom; and “Prospect of a City,” a public art work coordinated by the ASC and created by artist David Wilson. Last fall, Ryan’s “Urban Form” architecture class worked with the nonprofit organization Trips for Kids Charlotte on two projects. The first project challenged students to design a new space for the Re-Cyclery, the bike repair and retail shop that supports Trips for Kids. Students submitted designs for the Re-Cyclery, the bike repair and retail shop that support Trips for Kids. The 4,000-square-foot shop would go in the Innovation Barn, an old horse barn on Seigle Avenue near the city’s business district that is being transformed into a “circular economy” hub through a partnership between UNC Charlotte and Envision Charlotte. Two other groups of students were given a different task: design prototypes for a “trash bike,” a trailer that can attach to a bike, enabling the cyclist to pick up litter along greenways and thoroughfares. Inspired by an initiative in Cambridge and Somerville, Massachusetts, the city’s Solid Waste Services and UCP are considering a program that would employ low-income or homeless citizens to operate the bikes and clean up the city. LandDesign Sponsoring MUD class to study Digital Placemaking. Professor Ming-Chun Lee's augmented reality maps help people understand data at #HomeCLT exhibition.